free flip flop couch! | .liveit.loveit.blogit. 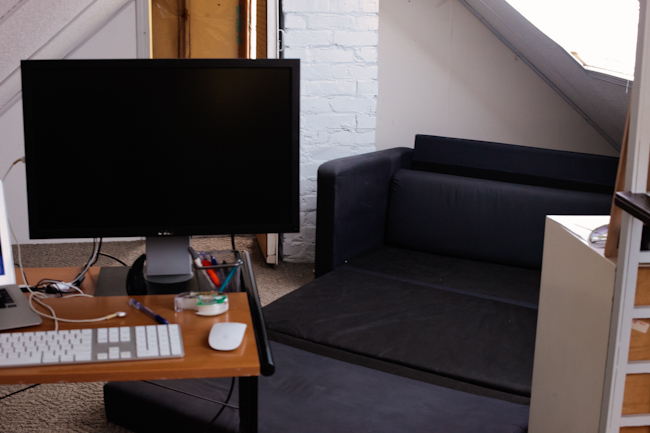 We’ve been looking for a small couch/bed for our office in the attic. This will serve not only as a couch for meetings and brainstorming, but also as a bed for our (younger) guests and as our bed when parents-aged guests come to stay. 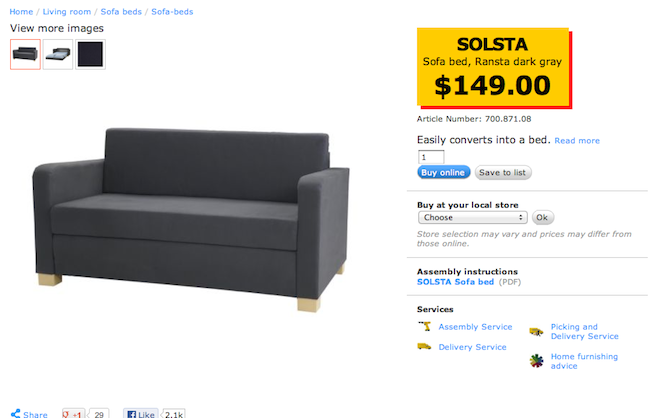 I’ve been trolling craigslist for months and had narrowed it down to either a futon or an Ikea Solsta flip-flop couch. 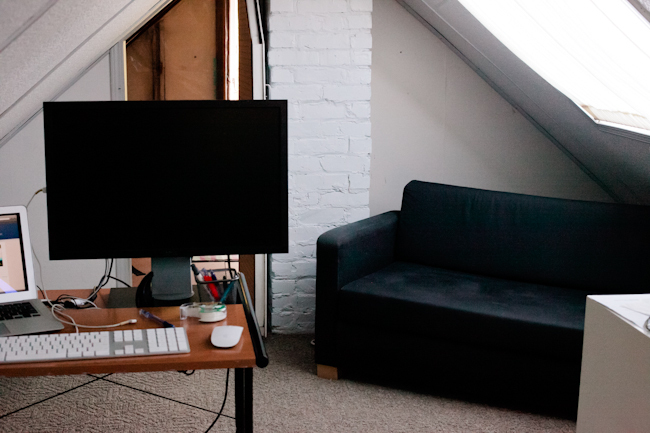 I liked the Solsta because of its small scale for our small (low ceilinged) attic, and because it is a dark colour (we’ve got a lot of white going on in our office). I liked the idea of a futon because you can actually get a futon with a fairly comfortable mattress, though I was a little worried about a futon being too long to fit anywhere. Also, lots of futons I came accross are beige. Not exactly a dark colour. Free Solsta? 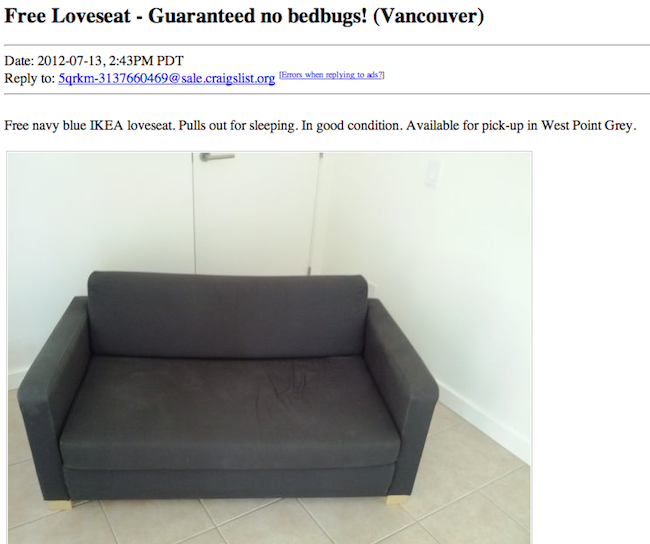 Guaranteed no bedbugs? That’s the kind of pricetag and guarantee I like! It would also give us the chance to try out the Solsta, and if it didn’t work, we could either sell it our give it away ourselves. Hi there! If you still have your loveseat I’ll take it for sure! Unfortunately, I don’t own a car a do car sharing and the first time a big enough vehicle is available is tomorrow morning, but I can come anytime and will take it for sure! I’ll have you notice that there are at least a few typos in that email, and I still had the best grammar. So that’s all it takes guys, good grammar, a bit of excitement, and a time that you can come pick the item up. If it is an easily google-able item don’t ask annoying questions like dimensions (you can find those on Ikea’s website). Be friendly, and maybe you can get free stuff too! And how does it look? (I warn you, the office is going through some growing pains at the moment, but in the nature of sharing, here we go.) It fits perfectly a little corner, is surprisingly comfy when pulled out (good enough for a few days sleeping, that’s for sure), and does a good job “grounding” all the white space in the room. So all in all, I would say this free find has been a success!